Do you have a hard time getting dreams out of your head and into reality? Not sure what to do with inspiration when it hits mid-meeting or at midnight? While you may be able to come up with new ideas, what to do with the pesky, flighty fellows is a whole other matter. Based on a gobsmacking, stop the bus moment I had recently, where my future course was irrevocably altered, I’ve come up with 4 steps for how to get dreams out of your head and into reality. Recently I attended the Crave Business Development Symposium and was fortunate enough to have my business selected to be profiled throughout the day. Translation: I got to have the laser bright lights of biz dev experts focus on me and Rock.Paper.Scissors all day. When they talked branding, marketing, sales, and finance, the examples they used, the applications they made were all focused on moi. Talk about heady. Talk about blistering heat that that kind of focus produces. I get giddy just thinking about it. But I digress. First out of the gate, Danielle LaPorte from White Hot Truth and Heather White of 2020 Communications illuminated a massive assumption I’d been making about distribution channels for my business. I had previously thought the only way for folks to get their hands on my training content was either by my doing training face to face or by training others to deliver the content. Not being interested in the latter I didn’t think about it any further. Until they uncovered the hidden assumption. The rest of the day was spent charting a whole new direction. Post It Notes: grab a stack of Post It Notes and carry them with you everywhere. When inspiration hits, write one idea down per post it. Don’t edit, don’t fret, just get your ideas down. I started using the bigger notes (3X3) but then switched to the smaller notes (1.5X2) as I found them easier to manage. Foam core: Buy a foam core display board, you can get one here. Take your burgeoning pile o’ stickies and sort them on the board. You can sort them by all sorts of criteria. Choose the one that makes sense to you. I sorted mine by marketing ideas, product/service ideas, sales ideas and resources I’ll need to source. See my example above. Best of all, you can change the sorting as time goes on, taking advantage of the removable, replaceable stickies. The foam core board is cheap, light, and it stands up for display (so you can marvel and coo at your brilliance). Light pen: Buy a pen that has a built in light. I found myself waking up several times in the middle of the night with blazing good ideas, only to have forgotten them in the morning. This one looks good. I’ve got it on order. In the meantime I’m keeping a pad of paper by my bedside with a regular pen. Excel spreadsheet: Transfer all your post it notes to an excel spreadsheet & then categorize them. 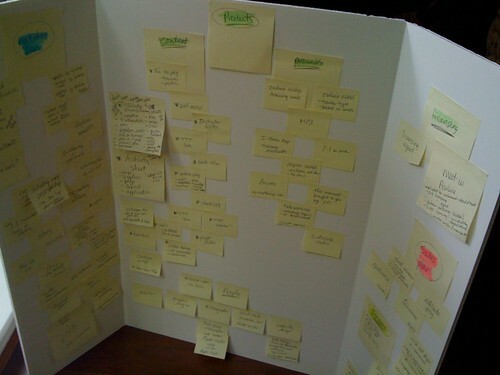 I used the same categories as I did with the display board plus a critical one …. due date. I’ve also added in how many hours I think each task is going to take me. I use the list function in excel (oh how I can opine about this lovely feature) – as it lets me sort by due date, type of idea etc. Now I have my workplan – what I need to do, how long it’s going to take me and when I need to do it by. It’s a thing of beauty. Heads up: I’ve used two of the 6 skills that you can learn to become more creative. Breaking assumptions is one of them. Engaging (getting organized and actually getting stuff done) is another. Want to learn more about the skills? Register for the ‘Embracing Creativity; How to Rediscover your Creative DNA’ course I’m teaching at Langara College in Vancouver, B.C. on June 23rd. Hope to see you there with or without your foam core! And you? What have you used to help you realize your dreams? Please let me know. If you use any of the suggestions above, please keep me posted (pun intended). Brilliant ideas Lee-Anne! So much inspiration ends as quickly as it was found because there is no act of capturing the information. This is a simple way to develop a plan, which is the best way to turn inspiration into action. I can’t wait to hear about how your plans develop using these tools. Thanks Lisa. Yes, I think the garbage bin is full of great ideas that never got acted upon. I know you have lots of great resources in your changemakerstoolbox.com are there any that you’d specifically recommend?